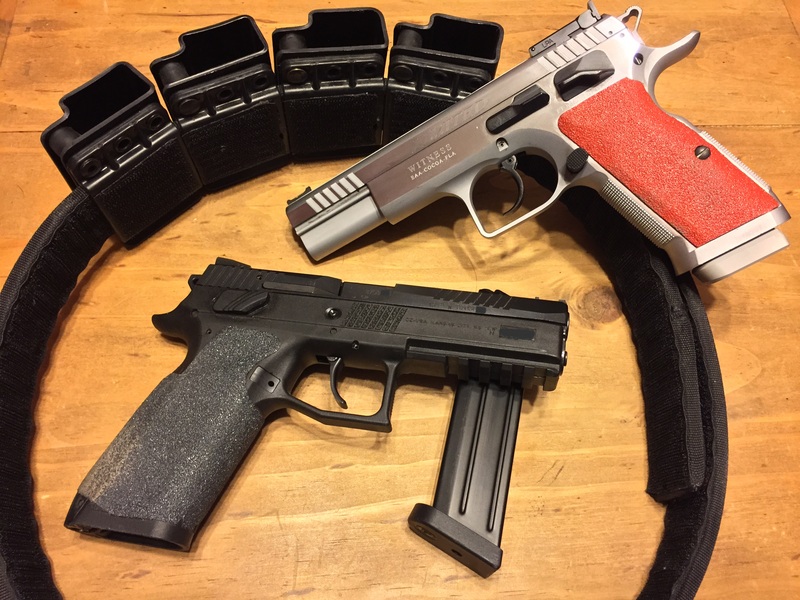 In the last 18 months I have changed my competition gun 3 times while chasing the elusive “perfect” pistol so allow me to spin you a yarn on what not to do. First, I must note that I am FAR from the first person to write or talk about this subject. Ben Stoeger had a Podcast about it and the guys at Triangle Tactical have warned against this more times than I can count. But I can be stubborn and had to learn these lessons hard way. It is my hope that you are not as stubborn as I am, and that you won’t repeat my mistakes. Oh the circuitous path I took. When I started in competition I wanted a gun that would work for competition, but also work as a defensive weapon. With that fallacy firmly in mind I went out and bought a Glock 34 – a fine competition gun by the way – then I sold it almost immediately for the XD-9 Tactical I wrote about in “My Time With An XD”. With my “competition” gun on hand, I geared up with a Comp-Tac International Holster, a cheapo mag pouch and a 5.11 Belt from Bass Pro Shops. The gun worked fine (the cheap mag pouch – not so much) but after a few matches I had a nagging “what if”; a “what if” that was only fueled when I got to dry fire Ben Stoeger’s Stock II and then shoot both a Stock II and a SP-01 that belonged to other people. It was with dreams of greatness that I sold the XD and proceeded to buy a CZ P-09. (the one in the photo) I had decided that I “needed” a DA/SA competition gun and already owning a 2nd generation P-07 I knew of CZ P- series awesomeness. Truthfully, deep down I knew I would end up with a metal gun, but I wanted to prove the DA/SA was something I could master and compete with first. What better than the bigger brother of a gun I already owned, right? It didn’t take long to fall in love with DA/SA and prove to myself it was the way I wanted to go. Thoughts confirmed, I pulled the trigger (pun intended) on a Tanfoglio Limited Pro. In all of that swapping and monkey motion I learned some valuable lessons. Losing money (gun) – I liked the XD, but it was never going to be what I really wanted. I knew if I fell in love with competitive shooting I would want a metal gun. I should have bought the CZ P-09 first. That would have given me a chance to run a DA/SA at the high round count class with Ben Stoeger and I would have ultimately saved money. I don’t regret buying the P-09; but I do regret the money I spent “learning” the XD, only to part ways with it 9 months later. Losing money – ancillary equipment – You just changed guns? Great! Now you can buy a new holster, spare parts, sights, trigger job, extra mags, and grip tape. If you are really lucky, your existing mag pouches won’t work (read: Tanfoglio Large Frame) and you get to modify what you have or order new ones. If there is a shining spot it is the fact you can re-coup some of that gear cost by including it in the sale of the gun. Ammo “wasted”?– It is nice to say we learn from every round shot, but wouldn’t it be nice to do that learning on a platform you will keep? Then you gain both the knowledge, as well as trust in the platform. I put about 1k through the P-09 before I moved to the Lim Pro and while I love the P-09 and plan on keeping it, it would be nice to have that ammo back to live fire practice with the Lim Pro. This desire to have the ammo back is an order of magnitude greater when thinking of the XD. Tracking Improvement – I am better now than a year ago, but I know it is not all the gear. I will proudly admit a 44 ounce gun with a 2.5# trigger is amazing and make for easy controlled pairs, but I must also admit that much of my improvement has been due to a refined trigger control, more efficient movements, and seeing what I need to see. To better illustrate, you can’t go back and start over with your beginner skill level every time you change gear. As you run and learn your new gear you are also adding to your current skill level. The simple fact is the improvement you realize from the gear change is over-stated in your mind. Rebooting, again and again – Oh, you have your mag changes down to 1 second? Great! Now change platforms and tell me what happens! Every time you change gear, you back up some and have to relearn draws, mag changes, transitions, and on, and on. Sometimes it is small – like going from the P-09 trigger to the Lim Pro and sometimes it is brutal. Pick a gun and stick with it – It seems that in most cases this is the best bet. But as with most things in life, there are concessions to be made. If you are starting out with a Ruger P89, you would probably benefit more from a gear change (update?) than someone starting out with a Glock G17. Similarly, if all you own is a G27 then by all means shoot it while planning for an upgrade; but I suggest staying with a G22 or G35 so the familiarity remains. Are there gains to be made by changing gear? Sometimes; but, first you need to evaluate your current skill level against the gains you will realistically see in the near term. I have dry fired an awful lot this year, likely enough to be a high A class in USPSA, but I am not because most of my dry fire time was spent learning new gear and not refining a specific skill. My advise? Decide if what you currently own will work and be realistic about it. A Glock 17 will take you to Grand Master in USPSA and Distinguished Master in IDPA, where as a Hi-Point probably won’t. If you want something better that’s fine, but I suggest you shoot what you have and save up to get what you really want the first time to minimize the re-learning. Bouncing around only waste time and money. If you don’t want to listen to my experience, that is also fine; I just ask you withhold your shock when you look back and realize the money and/or ammo spent. Lest anyone think this applies only to competition shooters, I have done CCW swapping as well; but that is a story for another day. Thanks for putting this so eloquently. I’ve been having a similar argument with myself on whether to buy a CZ 75B now, or save up and go straight to a Shadow. Is appears that you don’t condone owning a handgun in every caliber? Funny when I bought my first handgun it was a 9mm, and I said I wasn’t going to buy a 40 and there was no reason to buy a 380. I hadn’t planned on ever owning a revolver and the only other thing I was seriously considering was a 1911 in 45 and a 22LR for practice. Yeah well, so much for those thoughts; they went out the window relatively quickly. And after bouncing around from 9mm, 40, 380 and 45 in polymer; I decided I like steel/alloy handguns better than polymer (for a variety of reasons) and I absolutely enjoy my 9mm CZ75B Omega and CZ75 D PCR. I don’t shoot competition, but CZ would likely be one of my top choices in Semi-Auto if I did.